completely bypassed the really interesting viral element and gone straight to “aah.. isn’t that romantic”……….. I suppose it is, but not the point here. On a recent trip to Florence (Firenze) my travelling companion and I were pondering how things go viral on the Internet (in between doing cultural things, obviously). About this time we started to notice ‘the padlocks’. Hundreds of them, attached to various railings, bridges, artwork and other bits of street furniture. They were all around Florence and once you’ve seen one, you can’t stop, they are everywhere. A bit of a squeeze. 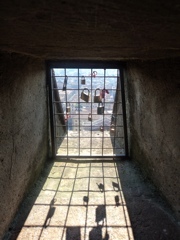 Some of the padlocks were in really ambitious places. The ones in the picture are about 1m deep inside a ventilation / light shaft close to the top of the Cathedral Dome. Impressive as I reckon it was a two person job. You’d need to climb and crawl in, and then get extracted by a companion. There were also some attached to lightning conductors in dangerous places high up on the Dome. It turns out that Love Padlocks is a ritual where sweethearts put a padlock on a public fixture and throw away the key to symbolise their everlasting love. It’s thought to have originated in China in the early 2000’s and is now happening in almost 30 countries globally. Maybe this is an example of something going viral in the physical world? Not everyone sees it as a positive and loving gesture though. In 2006 the Florence authorities tried to stamp out the practice, but the locks were being added faster than the workers could remove them. Judging by what I saw in the Florence authorities have well and truly lost the battle. 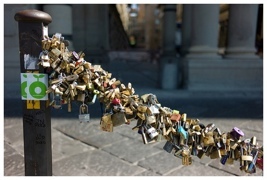 Love Padlocks are a good example of illustrating something going viral in the physical world. It’s not all You Tube videos and swine flu. City Authorities and their bolt cutters aren’t really a match for a bunch of disorganised sweethearts and their love padlocks. Wonder how many viruses humanity has caught over the millennia? If ninja turtles were an example then can we be sold them as well? There a few love padlocks starting to appear around Cardiff. I keep meaning to take a picture to update the post. You’ve reminded me, thanks. ← How many people actually participate in online communities of practice?